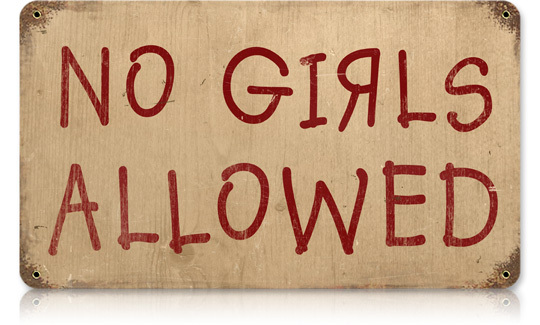 One criticism I often hear fired at Christianity is that it looks down on and oppresses women. “It is a male-dominating religion,” they say, implying that men use it like some lodge or club to rise to power while making women serve them. While there have no doubt been some periods in history in which women were looked down on or mistreated, that is no reflection on Christianity as a whole or of God’s love for both genders. In America, more women go to church than men. No matter whose poll you look at, women outnumber men in church on average of almost two to one. But beyond culture, let’s look to the Bible to see how God views women. God told Eve that her Seed would one day destroy Satan and sin; this was not a promise given to Adam (Genesis 3:15). A male-dominating religion would emphasize the work of the man over the woman. We see this promise finally carried out through Mary, the mother of Jesus. Mary is the one given credit for raising Jesus and being with Him until the end. Joseph, her husband, is not seen again in the Gospels after Jesus is twelve years old. He most likely passed away, but the woman Mary is the parent elevated in Jesus’ life. When Jesus was on earth, consider that the very first and most blatant claim He made to His deity was to a woman. In John 4 Jesus talks to “the woman at the well,” and in verse 26 He boldly tells her that He is the Messiah. Not only did He make His Messianic claim first to a woman, He also appeared first to a woman following His resurrection. Instead of appearing to Peter or John, Jesus chose first to present Himself to Mary Magdalene. We also see Jesus come to the aid of a woman who was being unfairly criticized by His disciples. When Mary (a different Mary) was pouring her expensive perfume on His feet and wiping them with her hair, Judas Iscariot began to complain and rally the other 11 against her. But Jesus scolded Judas Iscariot and defended her act of worship (John 12). And this favorable treatment of women was not unique to Jesus. After Paul received the Macedonian Call, the first convert he had to his new church was a women named Lydia (Acts 16). 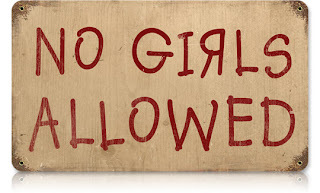 Because men did not want to marry widows these women were left with no voice; therefore, God gave Moses a law to protect them (Deuteronomy 25:5-10). This law of the levirate marriage said that a brother of the late husband would step in and marry the widow, thus allowing her to be provided for, raise children, and stay in the family and share in the inheritance. If there was no brother willing or able to perform his duty, then a kinsman redeemer, a near relative of the late husband, could step in and perform the role. There are certainly more examples that can be given, like the New Testament commands to take care of widows. But the point is clear: Christianity does not, and has never looked down on or mistreated women. There have been times when cultures have mistreated them—treating them as second class, denying the right to vote, etc., but Christianity in no way diminishes women. I was recently contacted by a group in Kenya, Africa, and they had a small request. 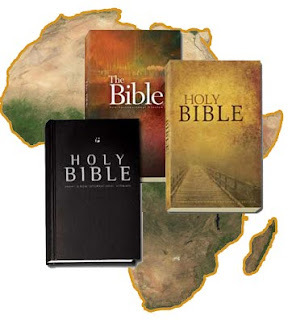 They would like Bibles printed in their native Ekegusii language. This is obviously a rare translation and hard to find. My initial thought was that this might be a scam. But they are not asking for money to help them buy Bibles; they are asking me to send them Bibles, new or used. In the past I have asked for help with sending Bibles to inmates, and readers of this blog graciously helped out. I will be sending Bibles into Kenya soon, but I wanted to give people a chance to help out once again. By working with a group located in Kenya (called Biblica) we are able to get Bibles to this church for under $5 each. Any help is greatly appreciated. 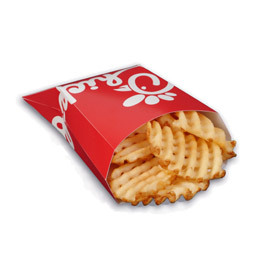 Chick-fil-A has resurfaced in the news this week with reports that they have “chickened out” on their support of traditional marriage. Yahoo ran a story about it last Wednesday saying that CFA will no longer give money to “anti-gay groups” like Focus on the Family and the Fellowship of Christians Athletes. When I read the article on Wednesday I became very upset. In such a dark era that we are living in, CFA seemed like a beacon of hope. Their stance on convictions, and the subsequent support of millions of people standing with them, was a breath of much-needed fresh air. CFA seemed almost like an Old Testament prophet, boldly standing up for what they believe in, and many of us were happy to take a stand with them. Some of us were even criticized for eating at their restaurant. Non-Christians were understandably upset by our support, and some Christians were, well, not understandably upset. CFA supporters were criticized on all fronts. So when the story broke that CFA had reversed course I felt like the air had been knocked out of me. The social media was abuzz calling them sellouts and hypocrites. Not wanting to weigh in until I knew the truth, I emailed CFA. I was very glad to receive my reply from their Chick-fil-A CARES office, which came just a few hours after I watched Governor Mike Huckabee’s interview on The O’Reilly Factor. On The Factor the governor said he had just personally spoken with Dan Cathy, and that the reports on the news simply were not true. The email that I received reiterated the governor’s comments to Bill O’Reilly. CFA has put out a list of what they support (literally, who they are), which has not changed, and does not appear to be changing any time soon. CFA wishes to stay out of the political debate, as they have always said, but their Christian values will remain intact. Read their policy here. Last time I blogged about CFA I ended by saying that was my last post about the organization, and that I would continue to eat more chicken. But after these false reports came out I thought another post was necessary, but the second half of my promise is still true: I will continue to eat more chicken. 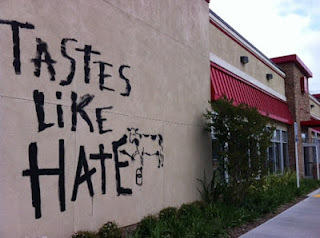 While CFA has continually been accused of being a place of hate, it seems that they are actually the victims of hate. But are those songs biblical? They come out of the writings of the Song of Solomon, but are we to understand those lines as describing Christ? The Song of Solomon is a collection of love poems that were written between two people who were deeply in love and about to be married. While we know that King Solomon is one of the writers, the other’s name has escaped us, and we know her today simply as the Shulamite woman. Some people believe that since this woman is not named then she never existed; some teach that this book is pure allegory, only existing to serve as symbolism. King Solomon, they say, represents Jesus as the Bridegroom, and this unnamed woman represents the church at large. Others believe that the Shulamite was a real person, but that this collection of their writings to each other is included in the canon simply for the benefit of the aforementioned allegory. But when it comes to interpreting the Bible, any allegory or typology can only be preached dogmatically if the Bible presents it as such, and when it comes to this Song of Songs, the Bible does not present it as allegory. It is, in fact, simply a collection of love poems. With that said, if there is imagery of Christ, like an object lesson, than it is still appropriate as a secondary application. Take, for example, the verse that says of Solomon, “his banner over me is love.” This can be said of Christ only because the Bible makes this claim about him. In Psalm 60:4-5 we read “You have set up a banner for those who fear you, that they may flee from the bow. That your loved ones may be delivered, give salvation by your right hand…” So the verses from Song of Solomon can serve as a secondary interpretation (in these times banners were very common sights in times of war). What, then, is the primary interpretation of Song of Solomon? It is a literal set of writings that show the beautiful love that a husband and wife should have for each other. Verses like 2:16 and 6:3 say, “My beloved is mine and I am his.” This book is the clearest picture of someone living out the command from the Garden of Eden, that the two should become one flesh. 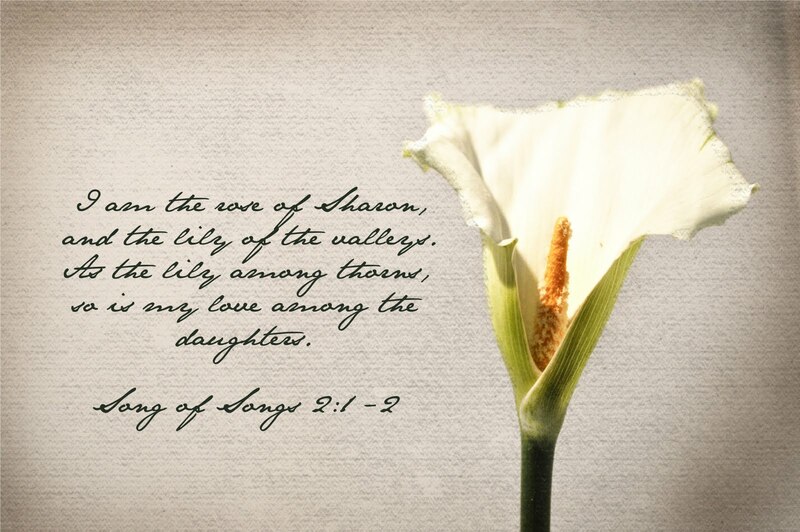 Is it still fair to make references to Jesus as the lily of the valley and the rose of Sharon? Not really. Remember, in this allegory Jesus has to be represented by the King (as the Bridegroom) and the church, the Bride, has to be represented by the Shulamite woman. Did Solomon say that he was the lily of the valley, or did the woman say those things about him? No, she said them about herself. “I am a rose of Sharon, a lily of the valley…he brought me to his banqueting table, his banner over me is love (2:1,4).” As you can see, it is not fair to apply all of what she said to Solomon (and likewise God); she said half of it about herself, and the other half about him. So what do we do with these lyrics? If we are staying with the imagery, then the church is the rose of Sharon and the lily of the valley. 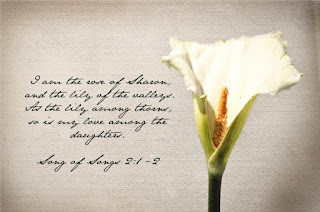 Sharon was an actual place that, in the days of Solomon, boasted large fields of beautiful flowers, and the rose has long been thought of as the symbol of the perfect flower. Therefore, to be the rose of Sharon would mean that she was the most beautiful among all the others. The same can be said of the lily of the valley. The lily is one of the largest flowers, and is considered by many to represent femininity. This might start to sound like the Shulamite is bragging about herself and her beauty, but she is not. She is enamored by the thought that out of all the women in the kingdom (and frankly, all the women in his harem) Solomon has chosen her and found her to be the most beautiful. When I was given John MacArthur’s newest book Twelve Unlikely Heroes to read for a review, I was excited because of how much I enjoyed his earlier books Twelve Ordinary Men and Twelve Extraordinary Women. I am also glad to say that I was not disappointed with this newest addition. While there are twelve heroes written about, there are only ten chapters because MacArthur twice groups people together. The heroes that he covers are Enoch, Joseph, Miriam, Samson and Gideon, Jonathan, Jonah, Esther, John the Baptist, James (the brother of Jesus), and Mark and Onesimus. As he did in the other two books, Pastor MacArthur thoroughly investigates the lives of each person, using every biblical reference to them to build his biography. But he goes even further, turning to outside historians and the writings of church fathers to fill in other details about culture and some of the events not recorded in Scripture. Pulling from Josephus, Origen, Eusebius, Justin Martyr, Irenaeus, Clement of Alexandria, and others, MacArthur gives the reader a closer look into the lives of these heroes. This book should inspire Christians by reminding that God can use anybody to accomplish great things for the ministry. 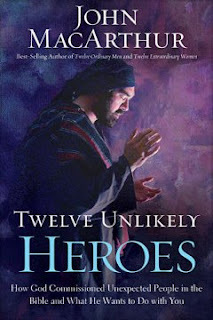 It also serves as a great resource by teaching on the lives of these twelve unlikely heroes.